Meet the new Givenchy Girl, Alyona Subbotina, having a runway exclusive-opening Givenchy Fall 2011 show is fantastic for rookie's debut. Alyona is from Kazahkstan and currently based in Singapore (Represented by Mannequin) where she is developing her model portfolio as well as studying at university. First time I recognize her when she's in Singapore, despite having never worked in major market, her book has gone from strength to strength. 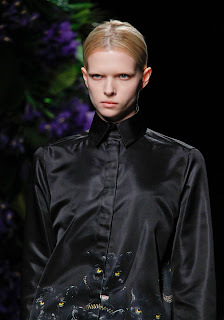 Alyona has an awkward beauty and completely typical of Tisci's Muses-say it, Maria Carla, Lara Stone, Lakshmi Menon, Natasha Poly, Ranya Mordanova, Iris Strubegger, Daphne Groeneveld, even Lea T with mostly of them has an intense staring look and hand-picked by Tisci itself to translate his vision, so no wonder if Alyona has been selected to opening Givenchy show, she's more than just suitable for it. Tisci also proved he's a man with an expert eye to accredited with launching the careers some of the world's leading supermodels, and I hope today will be including Alyona Subbotina.